"I'm acting now. I am about to appear in another movie, that's why I was at the NAACP," said television personality Melody Trice of "The Melody Trice Show" when I asked why she was now the one being interviewed on the red carpet. "I'm modeling too." Trice, aside from her own television show which reaches over 2 million viewers, has been making the media rounds thanks to the expansion of her brand from a television host to an actress and model. She recently started a cleansing program that caused her to loose more weight than when I first met her. At that time she was already looking good with a petite waist. She is even smaller now. The owner of the plan has been using her as a spokesperson and that resulted in an appearance on the "Steve Harvey Show". "You got to sleep with yourself and I need to rest," Melody laughed, when I commented on how sweet her personality was. "I don't care about what people say. I was voted most likely to succeed. My teacher said, ‘I'm going to see you one day on television'." He was so right. Melody started out as an actress/plus size model, and then she became a licensed cosmetologist and opened a beauty supply store. She gave that up for a daytime talk show, where she interviews high-profile celebrities on the red carpet and on her show. In just two short years she has amassed over 2 million viewers who watched as she interviews such high-profile artists as Omar Gooding, Mark Wahlberg, Hill Harper, Debbie Allen and Nick Cannon. "As a talk show host I've learned how important it is to be healthy," she admitted. "Entertainment is stressful and stress makes me over eat. Since I was 25 I've had high blood pressure. I went into prayer. I didn't want to take pills. God said, ‘Natural foods.' I was doing my research and I heard of this plan... In 6 days I lost 15 pounds and in 20 days I lost 27 pounds. For me the smaller, the better...I am more happier...more focused. I've lost 80 pounds. I drink a gallon of water a day. I stop drinking soda. You have to discipline yourself. (The program) is teaching me how." "The Melody Trice Show" is about inspiring her viewers by talking about subjects such as business, health, technology, music, beauty and careers. Just on Comcast alone her viewers are over ½ million. A SAG/AFTRA member, Melody's show also appears on AT&T, Frontier and Spectrum. You can check out "The Melody Trice Show" airing-schedule at www.MelodyTrice.com. 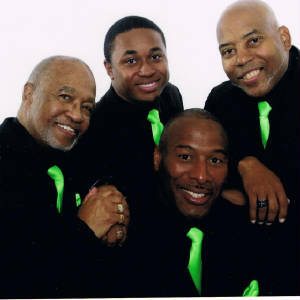 The harmony from the Mighty Men of Faith on their newest album release "Undisputable Is He" (N2L Records) is perfection. Individually the vocals are great and passionate, but together they offer the listener vocal perfection that mixes old-time Gospel with Contemporary Gospel, Pop, R&B and Praise & Worship. I personally love the old school sound reminiscent of the harmony of Earth, Wind and Fire and The Temptations. "We've been together since 2009. We started at a Men's Day Program," said Wendell Basey, founder of the four member vocal group that consist of Basey, Charles Johnson (a SAG actor), Richard Hayes ( pastor at Victory Center AME Zion) and Ed Harris (pastor at Agape Fellowship AME Zion Church). "It's not perfect all the time. We have not had the same members...two new members since 2013." What is perfect is the harmony that all four bring when they sing together. I love how they mix the different genres with Gospel and mainstream. I love the different deliveries styles that come with the different age groups they all bring together - new school, old- school and contemporary - making a fresh new sound that is different enough that they stand out. One of the new members, Charles Johnson, was acting in a musical about the music of the Might Men of Faith, when he was asked to join the group. A proposition he had to think on because of course his career was in acting. "Spreading the Word," Charles said was the attraction for him to decide to join the group. "The conviction they have for spreading the Word and their dedication. The chemistry is just awesome!" "We were just putting songs together for over a year," Wendell said about the new album "Undisputable Is He". "We didn't have a concept just making some songs. The songs reflect the belief that God is everything and everywhere." Writers on the new project include Steve Eaton ("Everywhere," "That's What He Did For Me"), who has written songs for The Carpenters and Art Garfunkel; David DeCuir "Lord of Lords" "Glory Will Be Revealed"), Malvin Scott ("God's Got My Back"), Curtis Hill ("Now I'm New"), Woody Woods ("Because He Loves Me" "Looks Like I'm Falling In Love"), Harold Lily (""It's All God"), Roger Helm ("Show Me The Way"), Luther Barnes ("It's a Good Thing to be Chosen"), David Sample ("River of Life") and Wendell Basey ("God's Got my Back"). "Undisputable Is He" is executive produced by Aaron Basey and Wendell.